Quality Air Heating and Air Conditioning > Articles > Air Conditioning > Why is the Condenser Fan in My Columbus, OH Air Conditioning System Shutting Off? Why is the Condenser Fan in My Columbus, OH Air Conditioning System Shutting Off? Does it seem as though your outdoor condenser fan keeps shutting off? There are two fans in your central air system, and the outdoor unit is designed to disperse the heat in the condenser coils by bringing outdoor air through the entire unit itself. It’s a critical part of your air conditioning system, and you need to be sure that it’s working properly at all times. But like any other aspect of your AC, there may come a time when it doesn’t work as you would like it to. 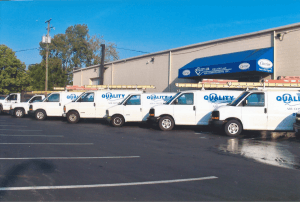 If you are in need of professional air conditioning services in Columbus, OH, then do not hesitate to call on the professionals at Quality Air Heating and Air Conditioning. Condenser fan problems need to be understood in the context of the fan’s function. The outdoor unit is a major part of the refrigerant cycle as a whole. The compressor takes the relatively low-pressure gas refrigerant and turns it into a high pressure and high temperature gas, well above even the hottest outdoor summer temperatures. Then it is sent around to the condenser coils where the refrigerant is condensed back into a cooler liquid where it can once again provide the cooling for your home. This process requires an exhaust fan so that the heat collected in your home can be dispersed to the outdoor air. So, why is your condenser fan shutting off? This could be due to a variety of reasons, but it’s possible that you have an electrical problem with the fan. The blower motor is connected to a control board that routes electrical energy to the AC. Obviously, over time, the connections may begin to endure enough wear and tear as to cause damage. Moisture and other environmental conditions can also adversely affect the process. The best preventive measure you can take to minimize repair needs and boost energy efficiency and performance is to enroll for routine maintenance. Call Quality Air Heating and Air Conditioning today for comprehensive Columbus, OH air conditioning repair services, including condenser fan repair.